I still remember the first time I realized that people who sound perfectly confident about what they’re saying are not always correct. It was sometime in my mid-20s (apparently I was a slow learner?) when I was in conversation with a friend of mine, and he said something about Yosemite National Park that I knew was incorrect. Mind you, it wasn’t something I thought I might have gotten wrong or was otherwise unsure about. I’d been going to Yosemite every year since I was born, so I was ninety-nine percent certain that my friend was stating something factually inaccurate. However, when I offered my expertise on the subject, he didn’t admit to not being sure himself. To every outward appearance he was just as confident about his correctness as he had ever been. And at that moment I had an epiphany: People could be telling me inaccurate information all the time, and unless it was a subject in which I had personal expertise, I would never know the difference. 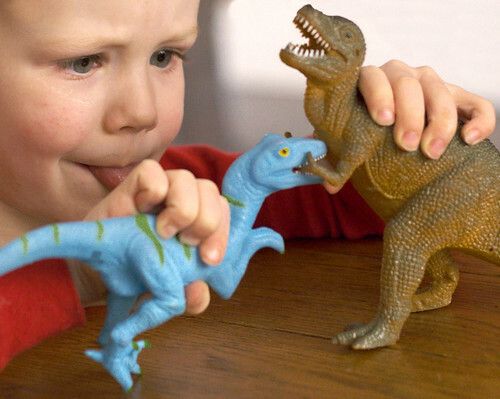 Dinosaurs and humans coexisted … um, right? No, but 41% of American adults think they did. Another aspect of the problem is oversimplification. It seems to me that while my life can be very complicated, that’s just a drop in the bucket compared to the amount of complications in the greater world. And yet it’s so easy to think about an issue or subject for only a minute or two and pronounce upon it, failing to delve into the deeper implications, the bigger picture, the history, or what-have-you. I’ll give an example that I see a fair amount. I happen to know something about the geopolitics of the Middle East. Do I have a complete understanding? No. Am I an expert? No again. Why not? Because the situation is complicated, and because it’s difficult to find reliable sources of information, and because I live far away and therefore can’t rely on firsthand experience. Also because I come from a different country and bring my own cultural expectations into my reasoning, and in spite of my best efforts, I’m sure some of that leaks through to color my opinions and observations. However, I do know enough to be able to tell when others know what they’re talking about (and when they don’t). I also know enough to notice when people seem to have formed opinions about situations in the Middle East even though they lack the background information necessary to develop a deep understanding. I don’t mind so much when I speak to people who have different opinions from me on this topic (on the contrary, it’s such a complicated topic that I welcome the chance to learn more, especially from those who are more personally involved and/or affected). However, when it becomes obvious that they’re not likewise trying to educate themselves even when they lack information (which is easy to lack when you live half-way around the world), well, then once again ignorance has won. And it will spread. I’m worried because this isn’t an inspirational post, and I like the inspirational posts the best. But for a problem like this, I don’t have any real answers. I try to do my best to be accurate in the information I pass along, but sometimes I make honest mistakes. I try to educate myself about the issues I care about, and I try not to profess knowledge I don’t have and instead ask questions to improve my understanding. (Six years ago, I knew nothing at all about the Middle East, for example.) When I hear information I know to be incorrect, I try to speak up, even though I often don’t feel like being assertive. But in an information-heavy world, there will always be information that is inaccurate or incomplete. And there will always be people who aren’t interested in listening. What do you think about this problem? How do you deal with it in your daily life? I think the biggest issue I have is something you touched on – passing on inaccurate information myself. But how do you know when something’s inaccurate? When I get that gut feeling I’ll go and wiki it. But sometimes, you just don’t, and it’s always a little embarrassing to be told you’re wrong, when you truly thought you were right. I guess it’s always good to have a dose of humility in your day? I think as writers this can be especially problematic because then it seems even more important to get facts correct (otherwise the story will suffer). Yes, it’s more common than we realize. Nobody knows everything. There are just some topics I’d rather avoid: the Middle East for example, because whatever I know about it won’t make a difference to that country (except to how much I pay for gas). And Charlie Sheen’s erratic behavior (he’s amusing to watch but I’d rather not discuss what he does or doesn’t do). However, I’m for helping to bring peace in the Middle East and to give Charlie Sheen a second chance. Often when I’m speaking I qualify myself, saying things like, “Well, I’m not completely sure about this, but….” Of course, I’m sure this affects how I come across, and I’m not sure if it’s a net positive gain. But it does make me feel better. If I’m dealing with an actual inaccuracy on my part or others, I turn to the Great Oracle of Google to deal with the problem. Sometimes there’s a vast amount of wildly conflicting data out there. In which case I state my preferred view, site the opposing viewpoints, and/or drop the whole issue. I smiled. “Precisely.” I spread my wings and took off, the downdraft whipping his long hair and almost knocking him from his feet. Cheeky little hippie. Google is very helpful for comparing facts. What did I do before Google?!?! In writing it’s especially tricky. Because yes, it’s fiction. But I’ve heard of numerous examples in which a writer gets a key fact wrong and it throws the reader out of the story. Which I don’t want to happen. I’ve noticed too that different readers have different levels of sensitivity to this issue. on March 17, 2011 at 6:08 am | Reply Writer’s Workspace: 3/17 « Comedy or Tragedy? Oh yes, this definitely fits in. And panels at cons are a great example. I know I’ve sat in the audience before thinking “What are they saying? I should be up there myself, because they don’t seem to have given this any thought!” And then I wonder if everyone else in the audience is secretly thinking the same thing, or believing incorrect information.